I have now been at Manjushri Di-Chen Buddhist Learning Centre for over two weeks and the glow has not worn off, in fact I think it has gotten stronger! Technically, I am here teaching computers to the 3 older grades, but more accurately, they are teaching me. Everyday I wake up to the sound of the boys scurrying around getting ready for morning puja (devotional chanting), then drift back into a super relaxed snooze before breakfast. After breakfast, I sort out what we will be covering for the day and head off to class. This is when my general state of awe begins. At 9:30, they all gather in the courtyard for the Manjushri mantra, which opens their minds to receiving wisdom (my understanding may be flawed, but I think this is the general gist of it). After that, they take off running for the computer room and greet me with “Good morning Miss!”. With 2 of the classes, we have been learning to make websites. The first steps was to decide what information the boys wanted to share. The topics they chose were one of the first major indications that these teenage boys have very different priorities then boys at home. One of the boys wants to share his thoughts about his village because, to him, it is heaven. When searching for pictures to put on the website (which has the tagline ‘love doesn’t depend on wealth’), google searches included “most beautiful flower” and “lovely image”. Another of the boys is creating a site focused on his dreams and thoughts on life. Sometimes, I catch myself standing behind them and just watching with admiration for how they process information and interact with each other. In general, there is a great level of kindness and respect amongst the boys that I have rarely seen before. Witnessing this sends my idealistic side to cloud nine. Don’t get me wrong, they are still teenage boys and still like to play and get into mischief, but even when they do, there is no maliciousness to it. Seeing firsthand how little ego is involved in the day to day life here has also had me reflecting on the way I have reacted to things in the past and re-evaluating those responses. The other day, while playing in the courtyard, the ball bounced up and broke a classroom window. If this was at a school at home, the boys probably would have taken off to hide. Instead they stuck around and joked about it. When Leasang (who runs the school) came to see what had happened, he wasn’t angry. It was clearly an accident, so no one got in trouble. At home, we often have a tendency to react immediately without looking at the whole situation, and seeing how this was handled here got me thinking a lot about that response and it’s impact. I had a chance to be abruptly reminded of this when one of the other volunteers reacted very harshly to something that she believed may have been said by another volunteer and instantly brought tension and negativity to all of us. It was a very unfortunate situation, but it also served as a great reminder of how unnecessary this reaction is and how easily it can be fixed by simply being open and willing to look at the big picture and find a solution. It may sound a bit like I’m gushing over these boys and this place, but that’s because I totally am. They have welcomed me into their school and their lives for as long as I can stay, and I am so appreciative for this. They have also allowed me to get involved in some of their day to day mischief. The other day, we headed down to the nearby river under the guise of cleaning. What ended up happening was some singing, dancing, water fights, and a whole lot of fun! One of the boys is a great break dancer and he showed off his skills in the field on our way back to the school. Some of the others tried to mimic him, but with some less then successful results. On the walk back, there were a couple of boys hiding in the long grass, waiting to jump out and scare us as we passed by. Another of the boys snuck into one of the temples and wiped some of the red dye on his face, pretending to be injured. I was quite worried when he slowly walked up, holding his face, covered in red, but then he dropped his hands and started laughing hard at my concern. He definitely got me and it was pretty hilarious! This totally random unplanned day was fantastic. 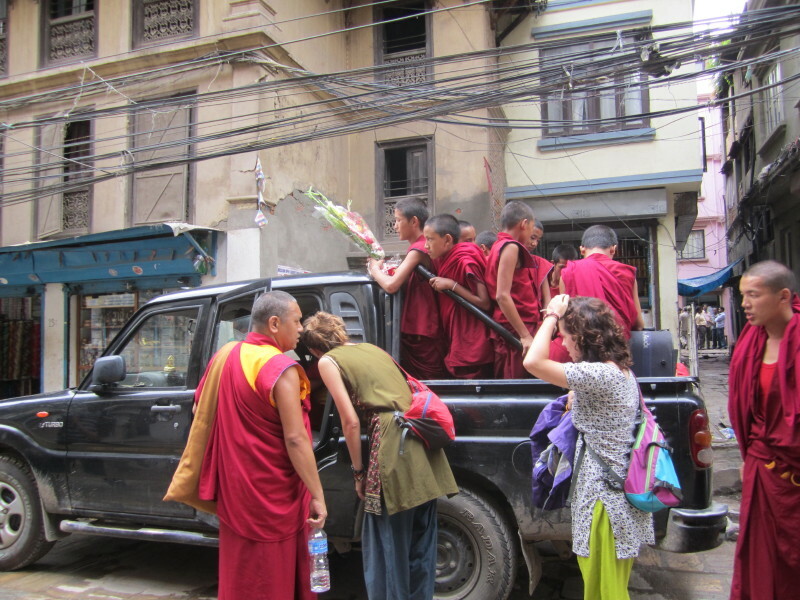 But it was not the only one…we also had a field trip to Kathmandu that was epic to say the least. The reason for the trip was to attend a Long Life Puja (chanting gathering) for the health of Rinpoche (kind of like the priest or wise teacher, translates to Precious One). We were welcomed into the temple as guests while many gathered outside to participate in the ceremony. Surrounded by monks and Tibetans in their finest clothes chanting for the health of their respected and devoted Drubthob Rinpoche, it was hard to believe that this was really happening. I was seated next to a woman who had fled Tibet in the 60’s, but who had known this gentle and caring man there and ever since. She was very friendly and we had a great chat. She mentioned that Drubthob Rinpoche is now in his mid-80’s and his health is beginning to fail. I was curious about what the thoughts behind the ceremony are, so I did a little research and found that “the long life puja purifies the relationship between teacher and disciple, and creates the merit for the teacher to remain among us. Since all realization depends on the blessing and guidance of the teacher, this ritual offering practice is extraordinarily precious”. 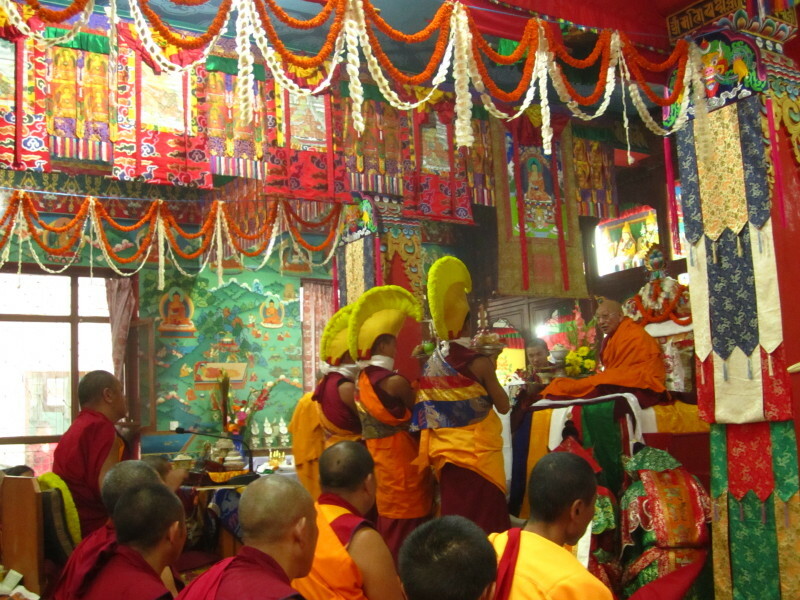 It was a very special day for both the followers of the Rinpoche and for us as guests. Some of the older boys performed a dance to the rhythm of the drums, cymbals and bells. There was Tibetan tea (butter tea…tastes how it sounds), tossing rice in the air, and blessings. After the ceremony there was a massive lunch and the leftovers were sent back up to the school with us. We loaded into the quad-cab truck to make the trip. The cab was packed, so I hopped in the back with the boys for the ride. There were 10 monks, one meditation student, myself and many bowls of lunch leftovers packed (standing room only) in the back for the ride from Kathmandu to Pharping. I was sure it would be an adventure, and when we arrived, I decided it will hopefully be a once-in-a-lifetime event. Haha…it was a wee bit uncomfortable. Stories like this seem to just keep happening here. Everyday, I have new adventures and eye-opening moments that I am sure will stay with me for a very long time. I can’t begin to explain how grateful I am for this experience. 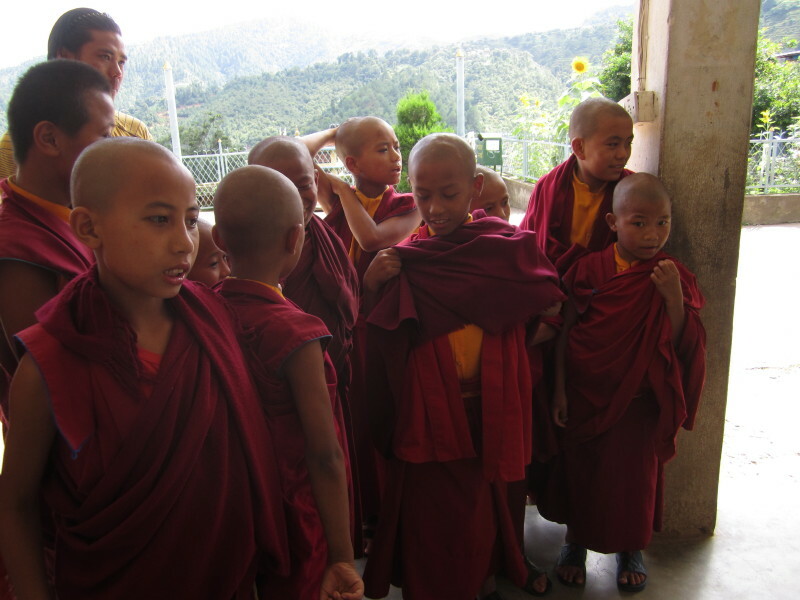 This entry was posted in Nepal, Traveling and tagged Lessons, Monastery, Monks, Nepal, Reflection. Bookmark the permalink. 8 Responses to The Monks and I…who is teaching who? That sounds pretty fantastic! Another very unique experience! I think it is going to be hard when it is time for you to leave these boys! It will be really hard! but who knows, maybe someday I will find my way back here. What a beautiful post, Kerri! I’m so happy for you to have experienced this. Absolutely loving your stories about all your adventures, and this one has to be one of my favourites! Thanks Rose! It’s great to hear from you. I will keep the stories coming!